At the last election, the party that prided itself most on posing as insurgent and anti-establishment was not Ukip or the Greens, but the BNP. It had done well enough in the European elections the previous year to win two seats: its first ever gains in a nationwide contest. Come the general election 12 months later, the BNP was making great play of targeting a number of high-profile seats, in particular Barking, where there was some rather loose talk of Labour’s Margaret Hodge being defeated. Nine of these 10 seats were won by Labour. The remaining seat, Burnley, was won by the Liberal Democrats. What might happen to the BNP’s vote in these constituencies at the 2015 election? More specifically, who stands to benefit most from the party’s waning fortunes over the past few years? A by-election was held in Rotherham on 29 November 2012: almost exactly halfway through the life of this parliament. In this by-election, Labour held the seat and saw its share of the vote rise from 44.6% to 46.3%. 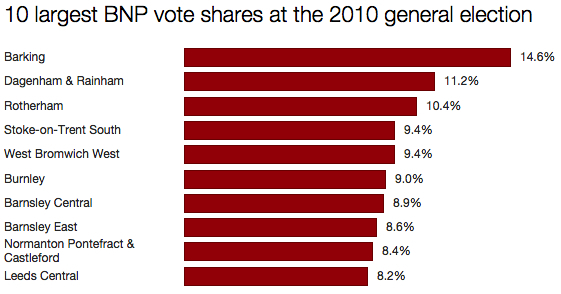 The BNP went from fourth place to third, but saw its share of the vote fall slightly from 10.4% to 8.5%. Of greatest significance, however, was the performance of Ukip. It leapt from sixth place in 2010 to second, polling 21.8%: a rise of 15.9 points. Much has happened to the BNP since that by-election, not least being wiped out at the European elections in 2014 and the resignation of its long-serving leader Nick Griffin. At present, it’s not clear if the party even intends to field a candidate in Rotherham. In fact, at the time of writing the BNP has not announced whether it intends to field a candidate in any of the 10 seats where it polled its highest shares in 2010. Where will those votes go this time round? Some may go to another far-right party. The English Democrats have candidates in two of those 10 constituencies: Barnsley Central, the seat of Labour MP Dan Jarvis, and Barnsley East, seat of Labour MP Michael Dugher. Some votes may drift back to the mainstream parties, though the biggest mainstream party on the right – the Conservatives – is not in with a chance of winning any of the 10 seats. Some may also end up going to Ukip. Of those 10 seats, Ukip is making a serious attempt at targeting Rotherham and will probably make a run at Dagenham & Rainham. I haven’t read anything that suggests they are eyeing the other eight. Nick Griffin has endorsed Ukip leader Nigel Farage and said he intends to vote Ukip at the election. It’s obviously not kind of the backing for which Farage would wish, though he has previously spoken of his pride at taking votes from the BNP, adding he has “no truck” with the party. In truth, there is no obvious “home” for ex-BNP votes. The party drew its support from both right and left, and it’s to the right and left that its former supporters will now go. It would be naive in the extreme to pretend there are not more choices on the right than the left, however. The Tories, Ukip and the English Democrats will probably all appeal in one way or another to voters who toyed with the BNP in the past. I’m not sure there is as great a quantity of options on the left. My feeling is this: the 2010 BNP vote comes in two flavours: protest, and genuine – and of these the little research that exists suggests that most was of the first type (though research is very difficult due to the huge stigma of voting BNP causing people to hide it). Those who voted BNP in 2010 in protest or out of apathy for mainstream politics are most likely to vote UKIP, the most recent insurgent, anti-Westminster party, and also one with a similar profile of being notionally right-wing but taking votes from across the spectrum. Those who voted BNP in 2010 because they shared the party’s beliefs are most likely not to vote, or remain with the BNP or English Democrats, or even the Loonies, if those are options in their constituency. They would seem unlikely to vote for a party that has made plain that it doesn’t want them, even if it is lying. The far right usually picks up its initial support from Labour in this country and it is very pleased indeed when it also picks up Tory votes as happened from 2008 to GE2010. Some Conservative websites were advising their supporters not to vote BNP during this time and were clearly worried. However Euro MP Andrew Brons left BNP to form his own party and did not contest 2014 election and Nick Griffin lost his seat and resigned leadership and was then expelled from BNP. Personally I think previous BNP votes will mainly transfer to UKIP and to not voting but will remain with BNP if they stand in Rotherham.